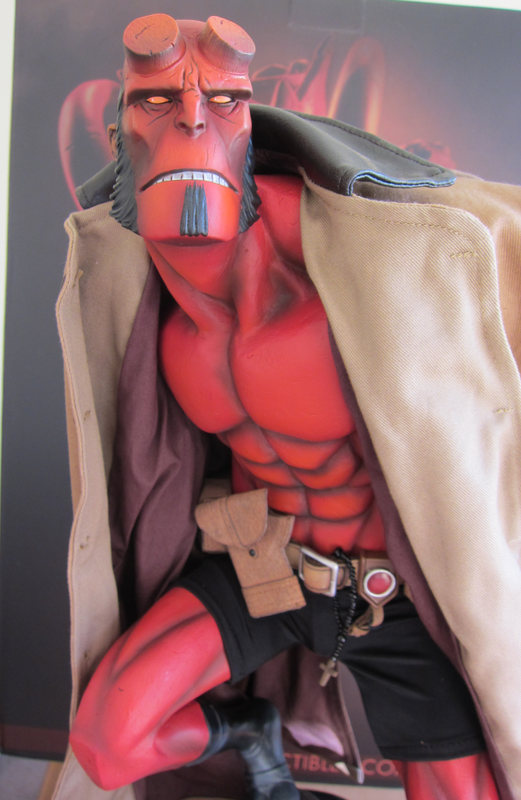 Review: Hellboy Premium Format™ Figure by Sideshow Collectibles | Action Points! 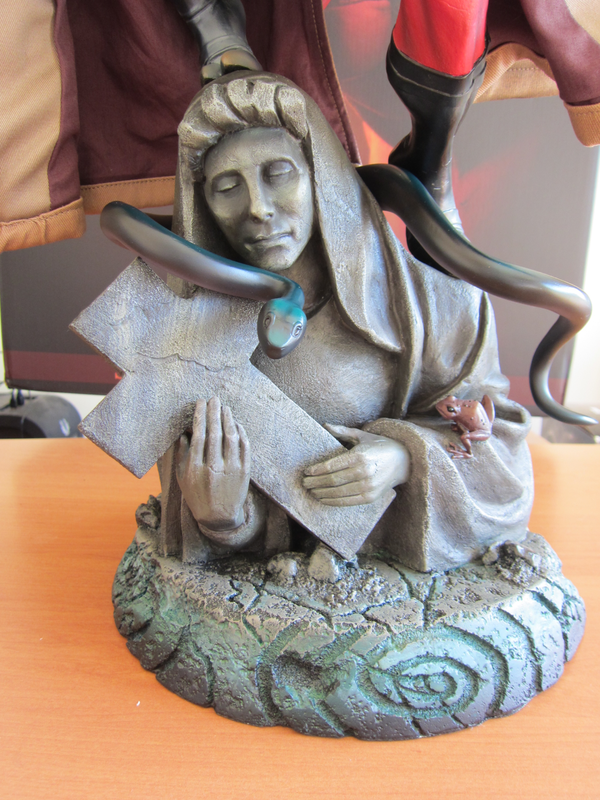 This statue tells a story. It speaks of those who came before and of those yet to come. It whispers a tale of intrigue and incompetence. 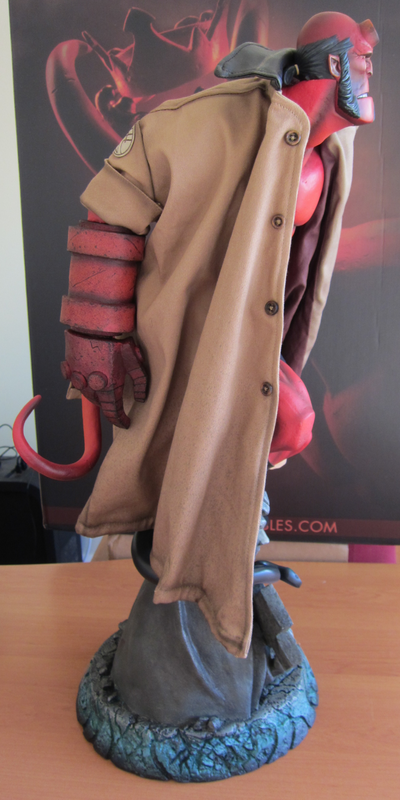 Hellboy reminds us that good will win out in the end and we can break free of our designs. We don’t need to submissively accept our fate. It was Friday morning. I had arranged the upstairs room with a play mat, cushions and toys, under the guise of it being an excellent location for entertaining my infant daughter. The reality was that I’d been tracking this parcel’s movements from Canoga Park, California, to Oakland, California, to Honolulu, Hawaii, to Alexandria, Sydney, to Derrimut, Melbourne, and I was waiting for the sound of the doorbell. I’d left a note on the door in bold pen, informing the driver that I was lying in wait, and that it would be dishonest to report back to base of my absence (as many a courier has done to me before). I read the notification in shock and awe. I checked the time. 1:50. I ran outside. My eyes darted up and down the street. There was no sign of a yellow van, and certainly nothing “left at garage”. Who had my Hellboy? And what world of discomfort did I have in store for this careless driver? I told him my location and he confirmed that it should have been delivered to this address, but that the system reported it was delivered to 51A. A quick search on my phone revealed that no such street existed in my suburb. The operator assured me he’d call back within the hour. Pacing around the lounge room, I messaged my wife in a panic. Kat was justifiably annoyed. 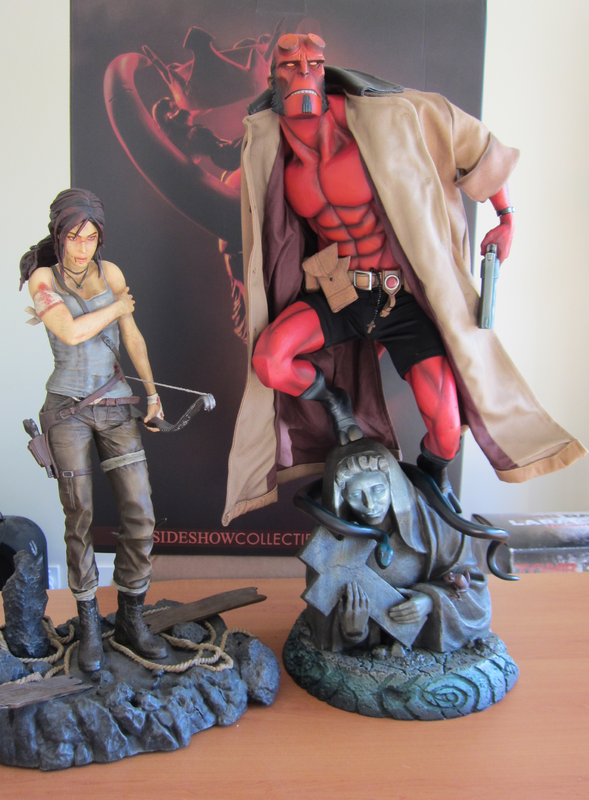 She was eager to find out what this much-hyped statue was, as I’d kept it a surprise. “Eaglehawk,” she texted, along with a map showing the property. The nearest address matching the Rd and house number was 20 minutes away, and in the shady part of town. As I made circuits of the lounge room, my phone rang again. An agent had been assigned to my case, and her compassionate but confused voice informed me that the package was probably still at 51A, and that the driver was unable to be contacted, but that she would keep trying and call me before 3:30pm. “He’s still delivering and perhaps might be very difficult to speak to at this time, but I’m so sorry for this mistake, it is 100% our fault.” Her Indian accent was soothing and sympathetic. There was time. The round trip would be 40 minutes, so I could make it there and back again before she was likely to call. I scrawled a note with the package number and my consent for it to be left by the door, should the driver arrive while I was gone. Marci started squawking, but once she was in the car, she quickly fell asleep. Google Maps led me to the other side of the bridge, that terrifying divide we Bendigonians prefer not to cross. My phone battery was nearly gone and the couple of minutes I waited at a rail crossing felt like an eternity. I hadn’t memorised the map – what would I do if my phone died? I returned Marci to her car seat and I pressed on down the road. Marci’s screams from the back seat echoed the frustration in my heart. Marci didn’t need this. Perhaps I should just go home, I thought. Before I could convince myself to turn back, I saw a letterbox with 51A written on it. It stood at the head of a 300m driveway. I could hear dogs barking, but I wasn’t about to turn back when Hellboy could be waiting for me at the end of that road. As I pulled my car up to the house, two dogs barked and screamed, paws resting against a waist-high fence. The German Shepherd and the St. Bernard looked as though their coats were too warm for such a hot afternoon, and I felt a little sorry for them. If they wanted to get at me, they merely needed to step over the barrier. I got out of the car to see if there was a clear path for the front door. The house was multi-storey and had a collection of statues in the front yard. Elephants and giraffes watched as I planned my next move. There was an open garage to the side of the house and I could see several boxes that might fit the bill. Instead of risking a dog attack as I tried to retrieve my toy, I decided to get back in the car and pull it right up to the garage. There were four boxes like mine waiting on the concrete floor. Marci’s cries bellowed along with the howls of the dogs. I made a beeline for the box with a large ‘S’ on the side. This had to be mine. Surely enough, this one had my details on it. The driver’s mistake was at once obvious. They were all the same size – 30 x 21 x 12 inches (around 76cm tall) and he’d taken one too many off his truck. Relief flooded through me as I sped back along the road. Marci and I had rescued Hellboy. He was safe.